In times of fiscal austerity we are sometimes confronted with making hard choices about our environmental health programs. This presentation will explore how to trim outdated or "sacred cow" programs and strengthen key programs with high public health benefit. The presentation will include case studies on how general fund tax dollars can be replaced with funds from other sources and on how interns, volunteers, and community partnerships can be used to strengthen priority programs. We surveyed public health and vector control agencies in the U.S. to identify barriers restricting the implementation of geospatial modeling for West Nile virus (WNV) control. We conducted 18 standardized interviews with public health and vector control agencies in states with the highest cumulative human WNV cases. Agencies were organized by their implementation of geospatial modeling (Initial: Implementation and Support; Internal: Surveillance and Mitigation, and External: Outreach and Communication) and thematic analysis was used to identify barriers and best practices. Initial: Implementation and Support agencies reported funding and educational barriers, while Internal: Surveillance and Mitigation agencies reported surveillance data challenges and mistrust of geospatial modeling as limiting geospatial modeling usage. Agencies involved in External: Outreach and Communication reported policy guidelines and lack of public interest as barriers to using geospatial modeling for WNV control. To overcome these challenges, we identified the use of unified resource programs, local data repositories, and multi-stakeholder taskforces for addressing these challenges to WNV control. The findings from this study can be used to help improve WNV control within the U.S. and might be equally valuable for preemptively mitigating the impacts of emerging and reemerging mosquito-borne diseases. The use of letter grades, colored placards, or a numbered score is seen across the country to convey to restaurant patrons information on how safe and clean a restaurant is (i.e., the findings of the local health department's inspection of the facility). This column goes beyond exploring this practice or its efficacy—it explores how local health departments go about developing such programs and if unnecessary staff and resources are being consumed by such projects. The column poses an interesting question on the creation of a unified brand to support capacity and calls upon the environmental health leadership to develop and present a standard by which a local health department can quickly and efficiently launch a grading or placarding program. Since 2002, the national Environmental Health Tracking Program of the Centers for Disease Control and Prevention (CDC) has provided vital support to state environmental public health efforts while simultaneously building a nationwide network of state, local, and academic partners to improve our nation’s capacity to understand and respond to environmental threats to public health. As part of program review and strategic planning, national thought leaders in environmental public health were convened to assess progress, identify gaps and challenges, and provide recommendations for enhancing the utility and impact of the Tracking Program. Several opportunities were identified. Chief among these was the need for continued and expanded CDC leadership to develop a coordinated Tracking Program agenda identifying specific scientific goals, data needs, and initiatives. Recommendations for future growth included expanded data availability and program coverage: i.e., making data available at the community scale and establishing tracking programs in all 50 states. Finally, a set of recommendations emphasizing communication to decision makers and the public was made that will be integral to the future utility and success of the Tracking Program. Can Realtor Education Reduce Lead Exposures for Vulnerable Populations? Lead is known for its devastating effects on people, particularly children under the age of six. Disturbed lead paint in homes is the most common source of lead poisoning of children. Preventive approaches including consumer education on the demand side of the housing market (purchasers and renters of housing units) and disclosure regulations on supply side of the housing market (landlords, homeowners, developers, and licensed realtors) have had mixed outcomes. The study described in this article considered whether a novel supply-side intervention that educates licensed real estate agents about the specific dangers of lead poisoning would result in better knowledge of lead hazards and improved behavior with respect to the information they convey to potential home buyers. Ninety-one licensed realtors were trained for four hours on lead hazards and their health impacts. Pre- and postsurveys and a six-month follow-up interview were conducted to assess the impact of the intervention on their knowledge and self-reported behaviors with clients. The findings suggest that supply-side education could have a salutary impact on realtor knowledge and behavior. The literature has been inconclusive concerning the connection between food safety manager certification and the incidence of critical food safety violations. An analysis of 2013 data from 1,547 restaurants in North, Central, and South Georgia health districts examined the relationship between the presence or absence of a certified food safety manager (CFSM) and the number of risk factors cited on food inspection reports and the food safety score. In addition, the study examined whether operation type (i.e., chain versus independently owned) had an impact on the number of risk factors and food safety score. Using a two-tailed independent-samples t-test revealed restaurants with a CFSM had significantly more risk factors cited on food safety inspections and lower food safety scores than restaurants without a CFSM. There was also a significant difference among chain and independent restaurants. Chain restaurants had fewer risk factors cited on restaurant inspections and had higher food safety scores. The Food Safety Modernization Act (FSMA) has recast the food safety landscape, including the role of the food safety professional. 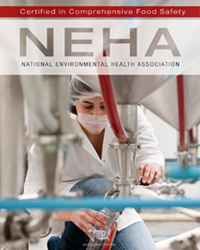 To position this field for the future, the National Environmental Health Association (NEHA) is proud to announce its newest credential — Certified in Comprehensive Food Safety (CCFS). The CCFS is a mid-level credential for food safety professionals. A professional that earns the CCFS credential will demonstrate expertise in how to assure food is safe for consumers throughout the manufacturing/processing environment. The CCFS credential can be utilized by anyone wanting to continue a growth path in the food safety sector, whether in a regulatory/oversight role or in a food safety management or compliance position within the private sector. The CCFS credential is a mark of distinction for those choosing a career in as a food safety professional in the manufacturing and processing areas.